Most of us prefer a card for online payments. Be it services or products, card payment comes in handy. Just by entering details like card number and CVV number, we can complete any transaction. And nothing can be better than knowing that the transaction is secure and our data is safe. In this article, we’ll see how ELEX Authorize.Net Payment Gateway for WooCommerce is a swift and secure gateway for any WooCommerce store. ELEX Authorize.Net Payment Gateway for WooCommerce uses AIM (Advanced Integration Module) API of Authorize.Net bundled with it. Authorize.Net provides an easy, safe, and affordable credit card processing option. Latest versions include features such as full or partial refunds and capturing them within your WooCommerce dashboard. It securely communicates with the connected financial institutions for processing. And finally, an automatic deposit takes place into your merchant account. If you can set up a plugin easily, using it becomes relatively easier. The setting page here shows the easy to use interface. You will find settings related to card payment here. You also get a setting page for setting up e-cheque payments. Visit the demo site for a real-time demo of all setting options here. Title: You can edit the name of the service and choose from the cards, you want to show on the cart page. Authorize.Net Login Credential: You get your login ID once you sign-up here. CVV Number can be made mandatory here. Transaction Mode: You can choose the mode to be ‘Live or Test’. In test mode, you can check if the plugin works perfectly for a purchase. No real money transaction takes place here. This should be used only for development purpose and your customers should not have access to this mode. Live mode is for actual transactions. 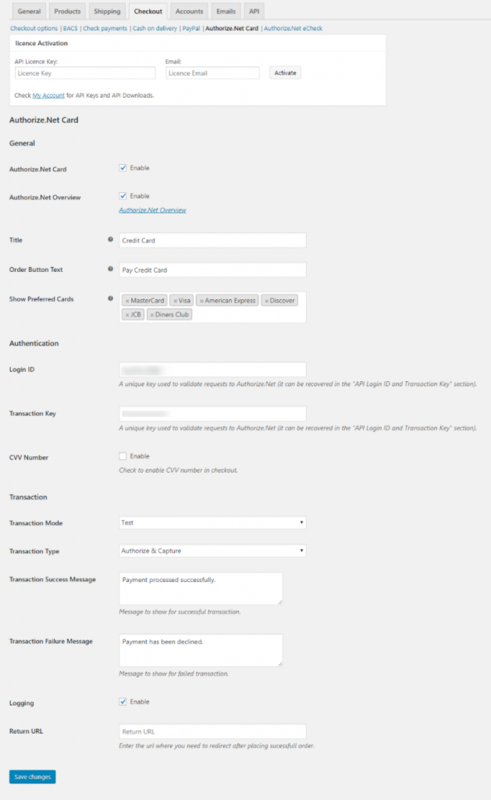 Transaction Type: ‘Authorize & Capture’ allows you to get the payment immediately after the order is placed. Authorizing and capturing of the payment happen automatically. The other option of ‘Authorize Only’ needs you to authorize charges and then capture the payment. To capture the payment, you need to navigate to an individual order page. Under Order Action box, you can capture the payment. Please refer, How to Capture and refund Authorized payment from Order Page? Failure and Sucess Message: Here you can set the message after complete or declined payments. Return URL lets you set a URL, of the page where you want to redirect your customers after placing their successful order. Here you get an overview of all transactions and other details. You can settle refund here. As per Authorize.Net, you log into a secure website called the Merchant Interface. Here you can manage all transactions, can configure account settings, view account statements, generate reports and more. If you still don’t have Authorize.Net Payment Gateway account and are interested in signing up for one, please visit https://www.authorize.net/signupnow/. Authorize.Net uses complex routing of data in a really quick time. The plugin is designed in such a way that only verification of some details is enough to facilitate the transaction. Here are the seven steps describing how the whole transaction takes place. The Plugin Integration manages the complex routing of the data on behalf of the merchant through the followings/entities. It passes the secure transaction information via a secure connection to the Processor. The Merchant Bank’s Processor submits the transaction to the credit card network (like Visa or MasterCard). The credit card network routes the transaction to the bank that issued the credit card to the customer. The issuing bank approves or declines the transaction based on the customer’s available funds and passes the transaction results back to the credit card network. The credit card network relays the transaction results to the merchant bank’s processor. The processor relays the transaction results to Authorize.Net plugin. The plugin stores the transaction results and sends them to the website for the customer and merchant to see. The issuing bank sends the appropriate funds for the transaction to the credit card network, which passes the funds to the merchant’s bank. The bank then deposits the funds into the merchant’s bank account. This is called ‘settlement’, and typically the transaction funds are deposited into the merchant’s primary bank account within two to four business days. Twitter analytics say that 75% of its audience like quick and easy buying. Quick and easy execution of payment stops customers from moving to some other site. So having this integration, you can save a lot of customers from moving away. On an average, these 7 steps finish within 2-3 minutes. And the good thing is that the plugin executes all steps only during the checkout. The customers don’t leave your site until the payment is completed. Authorize.Net is currently available for companies based in the United States of America, Canada, the United Kingdom, Europe, and Australia. 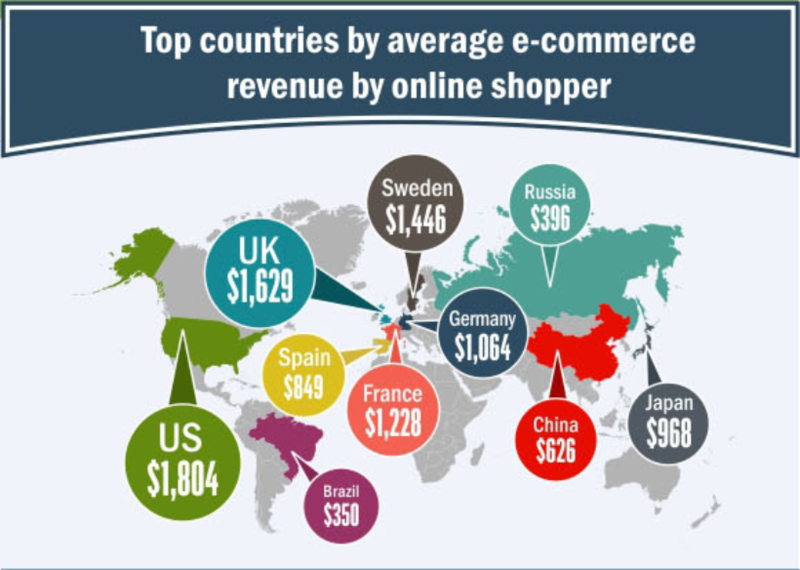 Studies show that more than close to 70% of e-commerce revenue is generated in these countries. With Australia and Canada included, the number gets closer to 75%. Also, According to Twitter Analytics, 70% of its audience uses Debit Cards for online shopping. So you can expect a majority of your customers using a debit/credit card as the payment mode. And having this swift gateway helps you to execute payments in the nick of time. With this, you also get free Authorize.Net Verified Merchant Seal which can be added to your website to help build consumer confidence. ‘Cards‘: It supports almost all major credit and debit cards such as Visa, MasterCard, American Express, Discover, Diner’s Club, JCB, and so on. This means customers having any of these cards will be able to complete the payment within seconds. Using this plugin you can also accept international transactions from the customers across the globe. ‘Authorize.net eCheck‘: This premium plugin makes your website ready to use the gateway to accept eCheck (accept and process payments from bank accounts directly through your website or the Authorize.Net Virtual Terminal) on your online store in a safe way. Thus expanding your customer base. Purchase of Payment Gateway: You pay a one time charge of $59.00 to get the annual subscription, free updates, and excellent support. Sign-up Fee: You pay a sign-up fee to Authorize.Net. Monthly and per-transaction fees to Authorize.Net for its services: Monthly charges can be customized based on your business profile and daily transactions. Per transaction fee is normally 2.99% or $0.30. You can negotiate rates and fee and must read the agreement before signing with Authorize.Net. Typical service fees- setup, monthly, and per- transaction—are determined by Authorize.Net resellers. You can find more details on pricing here. Security: Although, Authorize.Net safeguards your customer information and combats fraud. They also operate with a mission to provide the most secure and reliable payment solutions for you and your customers. Still, an SSL is recommended for PCI compliance due to the direct checkout to ensure that your customers’ credit card information is secure. 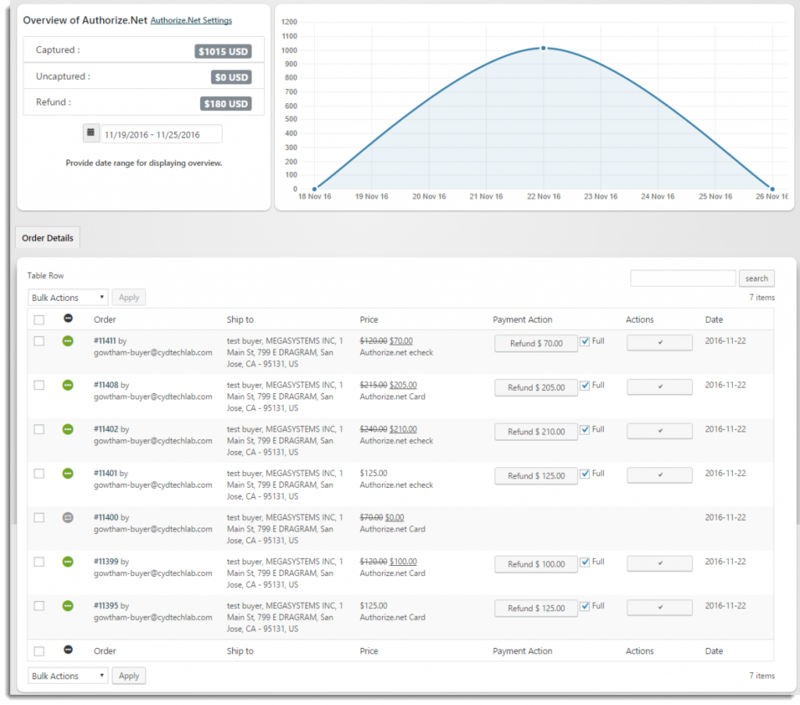 Authorize.Net dedicates significant resources toward a strong infrastructure. It adheres to both strict internal security policies and industry security initiatives. With Authorize.Net, your customers can be confident their data is secure. Authorize.Net utilize industry-leading technologies and protocols, and they are compliant with a number of government and industry security initiatives. Support: With the initial subscription you get one year of premium support and updates if any. You can continue using the plugin even after the first year. But without updates and premium support from ELEX side. Any support regarding services, rates, transactions, security concerns you can contact Authorize.Net for aa24X7 support here at Authorize.Net support. Too many payment gateways can be overwhelming sometimes. So it’s better to have a gateway to cover the maximum number of your customers. Authorize.Net allows you to do so. These below-listed features listed makes it a complete payment gateway. Customers are sent a detailed message if their card is being declined. You can customize the message in the edit box in the setting section. You can maintain transaction history, send payment notifications and most importantly the plugin maintains secure data storage lists. These features make it more just a Payment Gateway. The latest version is compatible with WooCommerce 3.0. and above. The license entitles you one year of support & updates. This can be renewed after 1 year at 50% discount. You also get a 30 Day Money Back Guarantee if you think this plugin is not for you. And I don’t think this is going to happen. To get your ELEX Authorize.Net Payment Gateway for WooCommerce visit our store. For details about the plugin and free demo click here. Shoot your pre-sale questions at our online support. For more information leave your queries in the comment section.